Glass façades on buildings must be one thing without fail: safe. Therefore, today, a laminated safety glass is integrated into façades around the world, containing a transparent special film from Saxony-Anhalt stuck into it. This film is called “evguard”®. It was developed by Folienwerk Wolfen, one of the world’s leading manufacturers of innovative special films. “evguard” is laminated between two glass panes, which increases the strength of the glass laminate and grants properties for long-lasting use as a safety glass or as a fire and sound protection glass. A further advantage of the protected brand film is its non-sensitivity towards many external influences such as chemicals, temperature fluctuations or air humidity. Reinforced in this way, the glass opens up new possibilities to architects as well. For the use of glass in frameless balusters and balustrades, for instance, but also for novel façade structures, illuminated stairs, glass domes or overhead glazing. Glass laminates produced with “evguard” film are also used to refine displays, for example on touchpads or screens of cash machines and ticket machines. The novel safety film is one of the “intelligent” materials of the product range of Folienwerk Wolfen GmbH, which is based in the Bitterfeld-Wolfen Chemical Park in Saxony-Anhalt. The company has been developing and producing plastic films for 27 years. More than 200 film types for further processing are produced by Folienwerk Wolfen. The films differ in terms of colour, ability to slide and strength. They are adapted individually or redeveloped depending on the use. For example, a few contain UV protection so as to protect products later packed in them. Each year, up to 20,000 tonnes of different plastic films are now manufactured – technical films for industry, developments for packaging or rippled lenticular films for printing with 3D effects or “flip images”. “We develop our products on a highly individual basis according to customer requirements, we react quickly and we also offer our individual solutions in smaller quantities and with short delivery times,” says the managing director of Folienwerk Wolfen GmbH, Günther Burkardt. The Wolfen-based team is one of the first plastic processors to combine the properties of various polymers in one film using the multi-layer technology. The films are tailored for the individual areas of use. The cheaper PET-A forms the interior of the film, while with the PET-G outer layer the properties of the film such as printability and weldability can be used in a targeted manner. Worldwide, in all continents, there is a film from Saxony-Anhalt in driving licences, in underground railway network cards or in credit cards, for example. Other countries choose the materials from Wolfen for manufacturing personal identification cards and passports. The company also produces for packaging of food, cosmetics and everyday products as well as for the sterile storage of surgical instruments. A special film variety is even available for packing kosher food, as such packaging must not contain any materials from animals. “However, animal components are used for certain additives, for example to improve the ability to slide of plastic parts. We produce a film that is demonstrably free of animal components,” explains Dr Steffen Bornemann, head of the development department. Every year, a rabbi certifies the production of the special film in the workshop. Since as early as 2003, films made of polylactic acid (PLA), a material acquired from regenerative raw materials, have been part of the product range. Many films consist of high-quality recyclate; in addition, segregated film waste of the customers is recycled. Such niche products show the versatility of the Wolfen film experts and are the basis for their financial success. 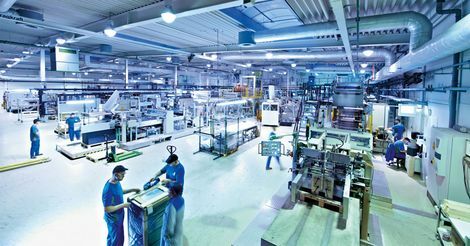 The film manufacturers are continuing the long tradition of the chemistry and plastics industry in Saxony-Anhalt. The company emerged in 1991 from the ORWO film factory, which, alongside providers such as AGFA and Kodak, was among the pioneers in the production of films as a basis for the phototechnical films and X-ray films. Folienwerk Wolfen GmbH was also one of the first companies in Bitterfeld to be formed by former employees of the ORWO film factory. The development was successful: the company began with 28 employees and now has 160. Its own research and development department contributes to its success. “We are constantly optimising our films and developing new products. Only with our individual solutions can we assert ourselves globally on the market,” says Dr Steffen Bornemann. The state of Saxony-Anhalt and the plastics and chemicals location of Bitterfeld-Wolfen offer the company outstanding site conditions. This includes several universities and research institutions in the direct proximity. There are partnerships, for example, with the universities of Merseburg and Anhalt, with the Martin Luther University Halle-Wittenberg in Halle (Saale), the Fraunhofer Centre for Silicon Photovoltaic (CSP) and the Fraunhofer Institute for the Microstructure of Active Agents and Systems (IMWS). In the last few years, for example, films have been optimised for glass laminates in laminated safety glass and in solar modules for extreme climate in collaboration with the Fraunhofer partners in Halle (Saale) in a project called “PV-Extrem”. These products are then integrated, for example, into house façades in countries along our planet’s “sun belt”.